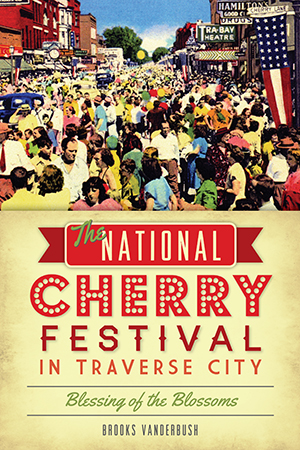 The National Cherry Festival is northern Michigan's most popular event. It turns Traverse City, a beach town of thirty thousand, into a thriving city of nearly one million. Begun almost a century ago, the festival started out as a small, neighborhood affair and grew into an international phenomenon that draws in visitors from all over the globe. Twist and pop a pit of Cherry Festival history with author and Traverse City native Brooks Vanderbush as he recounts the festival's growth and its queens and courts, governing bodies, past personalities and other memorable stories that have made it such an essential part of this vacation paradise. Traverse City native Brooks Vanderbush has been a staff writer, editor and freelance journalist in the Grand Traverse region for over a decade, covering everything from presidential elections to hometown garage sales. Brooks also spent two years living in Guatemala, writing for Central American publications and working as a public relations pro for Camino Seguro, a non-profit based in Antigua and Guatemala City. He lives in Traverse City with his wife and three children.